A couple weekends ago, my husband put new flooring in our room. He replaced the old carpet with laminate. We also rearranged the furniture and moved some furniture out. There are still a couple more things to be done, but I am loving the changes! Last week I shared this project I made for our room. Today I get to share my other project for the room..... a jewelry holder made by moi! I have had my eye on some of the jewelry stands from Urban Outfitters for a while. But they are $35-40 each, none of them was exactly what I wanted, and it would have taken up room on my dresser and be easier for my kids to get at. I had taken some other pictures as I made this project and I strongly suspect that my 3 year old, who is always using the camera to take random photos, may have erased some pictures. Oh well. I had taped it off so only the frame would be white, but when it was all done, it was just bor-ing! So I decided to break out the Mod Podge and add a cute pattern to the back. 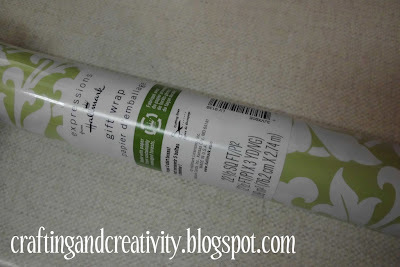 I used some pretty white & green wrapping paper! I have 2 jewelry boxes that are full, so these costume jewelry necklaces never had a home until now. It's so nice that they won't be tangled in a drawer anymore! I just made one of these using a frame but I love the way yours came out! 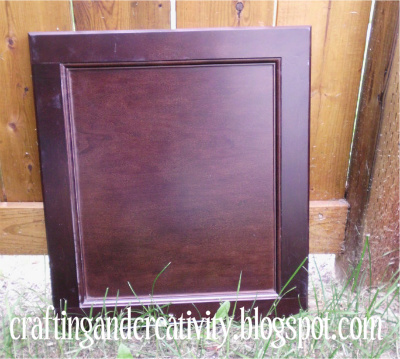 I took a Picture frame once for my granddaughter and took off the back. Painted the frame to match her room decor and hot glued strips of ribbon on to back of the frame working from top to bottom. 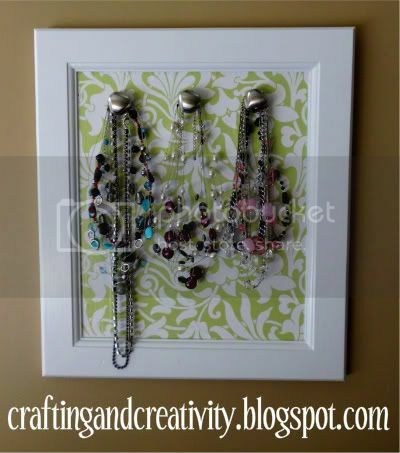 She now has a place to hang her hair clips. 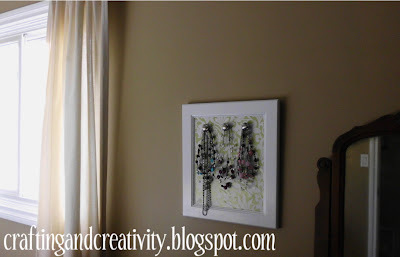 I also used ribbon to hang the frame on her wall. SO CUTE!!! I never would have thought of using wrapping paper! I so need to make one of these. Thanks SO much for sharing! I love it, I definitely need to try making one of these! New follower from the trendy treehouse link party! I love it and I have been wanting to make something to hold my jewelry for a while now. Thanks for sharing!! Wow, very nice! Thank you for sharing! Would make a cute gift for a teen girl! Pretty! I love the wrapping paper and knobs you chose! Very creative. That is very useful. 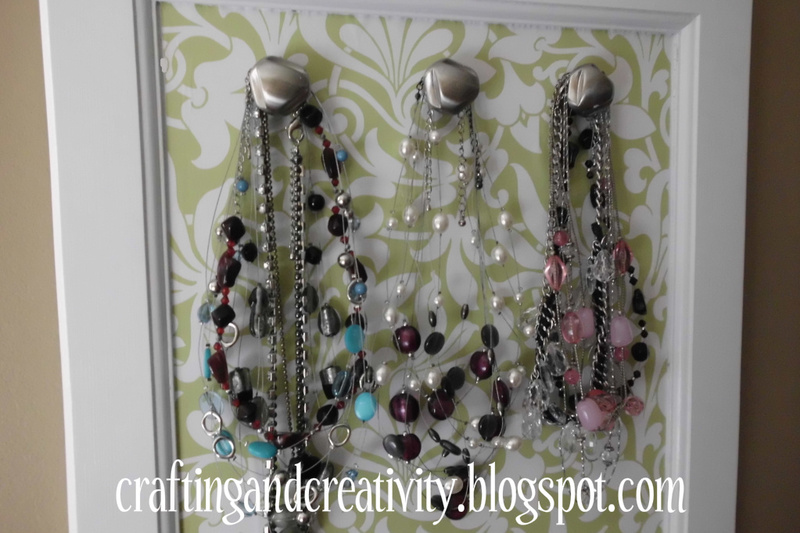 I will have to try this I have a lot of jewelry all tangled at the bottom drawer of my dresser.New follower from The Creative bloggers hop. Hope you stop by for a visit. This is adorable...my jewelry is in a pile in my bathroom. My chunky necklaces won't even fit in a traditional jewelry box. This would be perfect! Great idea! That looks really nice! This is adorable and functional! I love it. Hello, there! 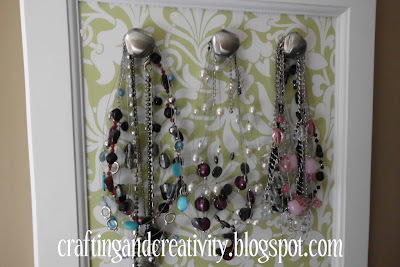 I'm popping over from Thrifty Thursday #24 and your necklace holder caught my eye immediately. Such a great idea! 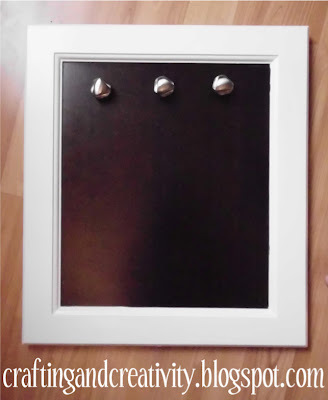 I recently used a cabinet door to make a serving tray (just added handles), and am planning to make a sign out of another door. There are so many things these babies can be used for! Love it! I'll be making one for my daughter in her dorm. Thank you for sharing. I'm in love with this! Great job. Just want to let you know I'll be featuring this on Sew Woodsy next week. Thanks for linking up! Love Love Love! I totally have been needing to make something like this! I'm impressed with the number of necklaces you have even with small children. Some of mine have been broken thanks to my son. Genius! I would've never though to use wrapping paper, but it looks amazing. Thanks for auditioning for American Crafter!